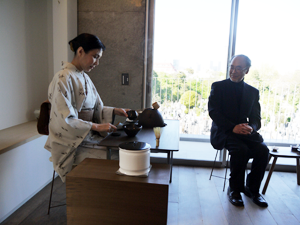 Whether you are beginner or experienced with tea ceremony or not, with a light heart, why not enjoy a practice of the tea ceremony just on a table in Minami Aoyama. The modern space is surrounded by beautiful scenery, which can be appreciated with some delicious green tea and traditional Japanese sweets. All the utensils are available here. Please contact us for details.